Hey Duggee: The Stick Badge and Other Exciting Stories! 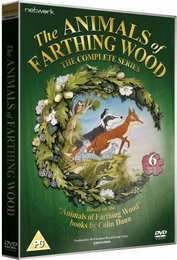 Based on the best-selling books by Colin Dann, The Animals of Farthing Wood captivated both children and adults alike with its tale of a group of wild animals driven out of their woodland home by urban developers. With notably strong characters and storylines, the series pulled no punches in depicting the animals' struggle for survival amid conflict, predation and the harshness of the elements in a world in which joy and tragedy exist side by side. This globally successful, BAFTA-nominated show ran for three series of 39 episodes, all of which are included in this set. When the bulldozers move in, the inhabitants of Farthing Wood know it's time to move on. Rallied by the firm-but-fair Fox, they set out on their long journey towards the sanctuary of White Deer Park – a journey fraught with danger.